Best location in town! Just redecorated. A perfect place for entertaining! The Alpenblick is the best location in Aspen. Located at the base of Ajax mountain and a block from the gondola, you can walk two short blocks to the center of town for Aspen's famed shopping, restaurants and nightlife. Or you can pamper yourself at the spa at the luxurious St. Regis hotel directly across the street. In the winter you can ski to just across the street. The free shuttle that takes you to Snowmass, Highlands, and Buttermilk is just a half block away. And our unit faces the terrace with dinning area, heated swimming pool, gas grill and large jacuzzi and has excellent views of downtown and the surrounding mountains! No car is needed but we have one for use in the summer to get to the golf courses and outlying hikes. The unit does have parking for one car which is a rarity for Aspen. This town home has four bedrooms (two masters) each with their own full bathroom. Both master baths have a steam shower and one has a jacuzzi tub. All four bedrooms have high-quality queen size beds with down comforters and luxurious linens. Upon entering there is a closet that will hold all ski boots, coats and jackets which is vented to ensure everything will dry quickly. Our kitchen has granite counter tops, gourmet six burner gas stove/range stainless steel appliances and all the necessities for cooking at home. It also has a cherry top breakfast bar with three bar stools that is open to the living room for comfortable entertaining. The dining room table seats 8. The living room has a cherry floor with warm and inviting furnishings. The cedar lined closets add a special touch for your clothing storage. And each room in the house has a flat screen TV and a state-of-the-art sound system and ultra high-speed internet throughout. We also have a humidifiers on site for your use. We have a pool terrace outside the front door that is perfect for outdoor dining and entertaining. Mike & Bill purchased Alpenblick #4 & #5 in 1993. Both units underwent a massive remodel to become one Luxury 2,000 square foot townhome. With 4 bedrooms and 4 1/2 baths, this high tech townhouse is right in the middle of it all. Even though Bill is an avid Deep Sea Fisherman and lives on the East Coast and Mike lives on the West Coast. Both always find time to head to Aspen for their skiing passion. This is one of the few properties in town that has a semi-private pool, Jacuzzi, a grill and dining area just outside of the front door. Alpenblick is on a very quiet street and has beautiful gardens and two large lawns. We also have permitted parking. toilet, tub, shower, Also has a steam shower to relax in. TVs are in all bedrooms plus one in the kitchen and a big screen in the living room. TV's have DVRs to record your favorite shows or game. DSL internet. Flat screen TVs in all rooms of the house with the exception of one, sound system wired through out the entire condominium for radio, TV, DVD, DVR and movies, gorgeous cherry wood floors through out, spiral staircase to access all three levels in this 4 bedroom 4 bath luxury condominium is just the beginning. Open kitchen with breakfast bar, all stainless appliances opens into the dining/living area for comfortable entertaining. Master bathroom have Jacuzzi tub. Our friends were so envious! We had quite a few friends enjoying a ski week in Aspen last week, and each group made their own arrangements. I spotted what looked like a good deal at Alpenblick (around the corner from the Gondola, up the street from the center of town) and booked it for my party. Wow! So nicely designed, with the bedrooms up and downstairs and the common areas on the main floor, beautiful woodwork everywhere. A kitchen with everything (I mean, everything!) you could possibly need to make dinner for eight or more, if you're so inclined. We met one of the owners and quickly became friends. 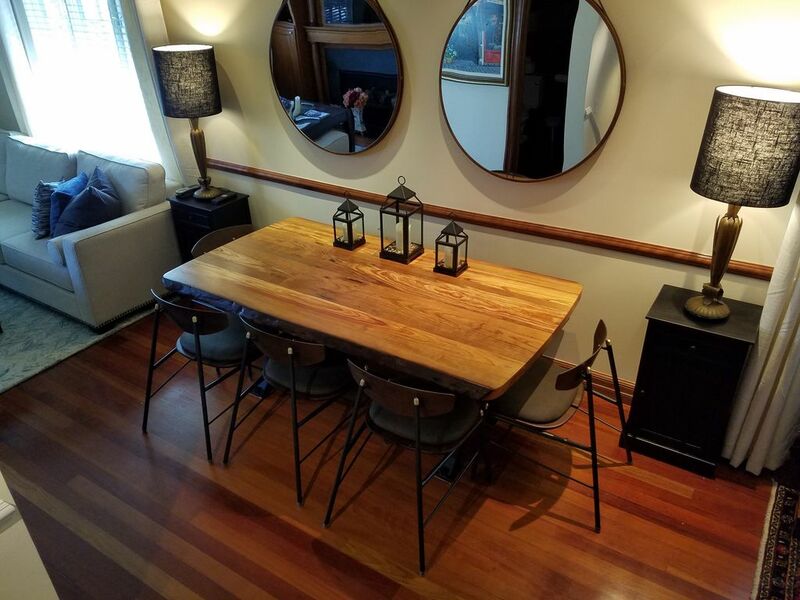 The table you see in the photo was custom made from wood he retrieved from a river in Nicaragua! On our last day, I watched the NFL Conference championships on a huge screen and the remotes weren't even hard to figure out! Even the lighting is well done and lets you set the desired mood. When you step outside, there is a common pool and Jacuzzi - everything is well maintained. Our friends couldn't believe what we received for what we paid. But hold your horses, folks - we've already booked the unit for next year! Our family and I stayed at this beautiful property for the NYE weekend and it was absolutely amazing! There was plenty room for our entire family and more. For sure the best part of this property is the location. We were able to walk to all of our dinners and also to the gondola! We will definitely be back! THe owners were very accommodating when a snow storm delayed our departure. The property is in a great location. 170 steps from snow to front door. A little further to the lift and about 2.5 blocks to the gondola. The property itself is good. Not as spacious as you’d expect for four bedrooms, but fit seven adult guys just fine with some creativity. The pool and hot tub are just outside the front door. The condo is located a three minute walk from the gondola. It comprises of three levels. The upper level contains two bedrooms with ensuites. The middle floor ground floor level has a kitchen, dining area and lounge room with a bathroom. The lower ground floor contains two bedrooms with ensuite bathrooms and a laundry. The pool and spa are ideally located at your front doorstep. There is a barbecue located at the pool available to be used by all the occupants. The premises are ideally centrally located. More importantly, the owners Michael and Bill are easily contactable, very responsive and obliging. They are lovely people, and we as a family of six, would have no hesitation in staying there again. We stayed during the Christmas Holiday in 2017 and this was our first time in Aspen. This home is fantastic - everything is top notch and the Condo is very comfortable. We interacted with the owner and the Property Manager on a couple of occasions and they were very, very responsive and extremely helpful. The location is as advertised and extremely close to downtown and Ajax mountain. The only - very minor - suggestion I might have is to have the Water Heater enlarged in capacity or install an Instant Tankless Water Heater to help support the potential hot water consumption. next to restaurant and shopping. 1 Block from the Silver Queen Gondola. Contact us for discounted long term or monthly rates.